We always stay here when traveling from Ontario to Halifax...makes a great half way point. The restaurant serves a good assortment of food...something for everyone. The rooms are spacious and clean. Desoration is old and beds are cheap (hard). Stairs to go to 2nd floor. Where to find Degelis hotels near an airport? 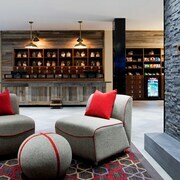 Where can I find hotels in Degelis that are near tourist attractions? Expedia's large Canada accommodation database features 13 hotels within a 0.1-kilometre (0.06-mile) radius of Degelis. 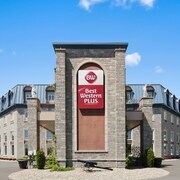 The Best Western Plus Edmundston Hotel, New Brunswick, which is the nearest hotel, is 30 kilometres (18 miles) from downtown Degelis. 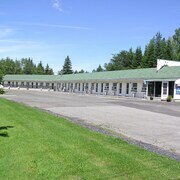 Another option is the Travelodge Edmundston, located in New Brunswick, 25 kilometres (16 miles) from the middle of Degelis. 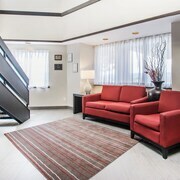 30 kilometres (18 miles) away from downtown Degelis, is the Comfort Inn Edmundston. 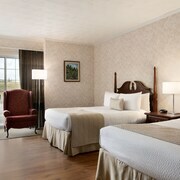 Alternatively, the Four Points by Sheraton Edmundston can be found 30 kilometres (18 miles) away. 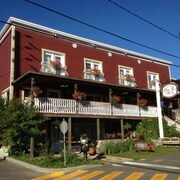 Another possibility is to make a booking at the Auberge Les Jardins Inn or the Auberge la Dolce Vita. Time permitting, you could explore more of Bas-Saint-Laurent. Visit Bas-Saint-Laurent's old towns, fortresses and churches and photograph its forests, rivers, streams and lakes. Fun-loving visitors can try their hand at snowboarding in this part of Canada. 80 kilometres (50 miles) to the west of Degelis is Riviere Du Loup, where you can explore Parc des Chutes and Cegep De Riviere-du-Loup. 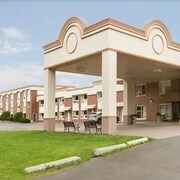 The Best Western Plus Hotel Levesque and Quality Inn Riviere-du-loup are just some of the hotel options in Riviere Du Loup. Alternatively, you could consider staying at Le Bic, 85 kilometres (54 miles) to the north of Degelis, where you can pick from the Gite de la Baie Hatée and Auberge du Mange Grenouille. While in Le Bic, set aside a little time to check out the Le Club de Golf du Bic and Parc du Mont Saint-Louis. If you are flying into or out of Northern Maine Regional Airport and are looking to stay nearby try Hampton Inn Presque Isle or Presque Isle Inn & Convention Center. What are the most popular Degelis hotels? Are there hotels in other cities near Degelis? 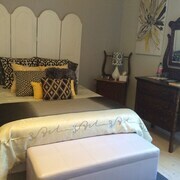 What other types of accommodations are available in Degelis? Explore Degelis with Expedia.ca’s Travel Guides to find the best flights, cars, holiday packages and more!